According to the survey by the Social Weather Stations (SWS) in the 3rd quarter of 2014, an estimated of 12.1 million families in the Philippines considered themselves poor. Meanwhile, an estimated of 9.3 million families consider themselves food-poor. Households in Metro Manila need a monthly budget of P15,000.00 for home expenses for them not to be considered poor. The needed monthly budget for households in the rest of Luzon and Mindanao remains at P10,000.00. The government continue to focus on intensifying programs for poverty reduction and social protection. What is the implication of this survey to a common Filipino folk? How can a P15,000.00 or P10,000.00 monthly budget fill the empty table of the poor Filipino family? Here, among the rest, we emphasize the importance of making an effective monthly budget so the Filipino can prioritize on the most important while finding ways to meet the needs of the family. 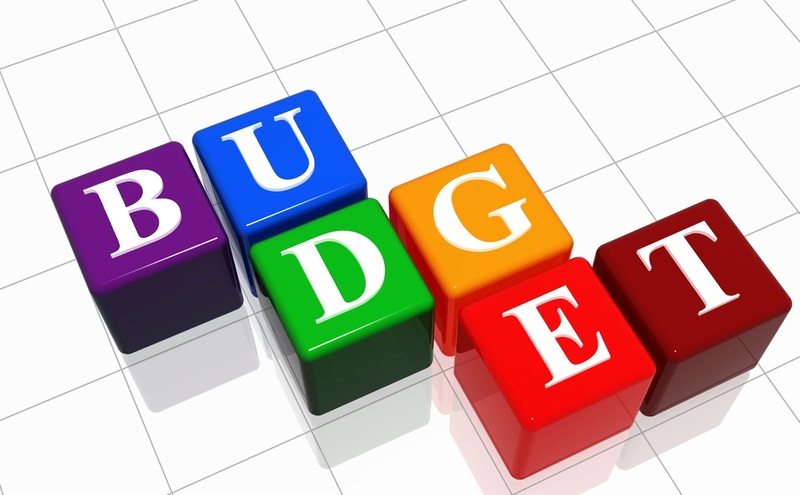 A budget is an estimate of income and expenditures for a set period of time. In accounting, it is a document for recording actual and projected income and expenditures over time. Budgeting is the process of setting up these estimates, setting financial goals, forecasting financial resources and needs, and monitoring and controlling income and expenditures, and evaluating progress toward achieving the financial goals. In this article, we will learn about making an effective monthly budget. Budgeting is an art, yet it should follow a simple formula or process to become effective. What are the basic points to consider when making a budget? 1. Goal Setting - this is making definite, measurable and attainable targets when setting up a budget. 2. Data Gathering - the way data are gathered and recorded. There are many ways, but in this article, we will discuss the simplest form of gathering data. 3. Forecasting Future Needs - this is looking in a two, three or four future periods to identify the needs to be satisfied or problems to be solved. 4. Budget Implementation - this is the system of procedures and plans in implementing the budget. 5. Controlling The Spending - the way of spending based on the budget or targets. 6. Performance Evaluation - observing and monitoring the budget process and results, and improving the process. I will demonstrate in 6 steps how to make a simple budget works. The tools you need are : a small pocket notebook, graph paper or Microsoft Excel, calculator, and the data. 1. Gathering Data - This is a simple process. What you are going to do is record all your income and expenditures. Carry a small pocket notebook with you and jot down all the receipts of money and disbursements everyday. Put a date on every record, and categorize the income and expenses. For example, you had eaten in a restaurant, you will write Meals for P65.00 or Food whatever is favorable to you. If you ride a taxi, you will write Transportation for P45.00 on your pocket notebook. If you received your wage in a week, you write Income-Wage for P1,000.00 or Income-Salary. 2. Plotting Your Record - Input your data from your notebook to a graph paper or to a Microsoft Excel spreadsheet. Organize the items by category and make a monthly graph of your income, expenses and savings. You can use graph paper and make your own ledgers or Microsoft Excel, or accounting software like Quicken or Microsoft Money. In this demo, we will be using Microsoft Excel. Rule : Divide and Conquer - When plotting your income and expenses, you have to properly categorize each item. You will be using these information when you make a report on the result of your records and then, when interpreting such reports and when making decisions. 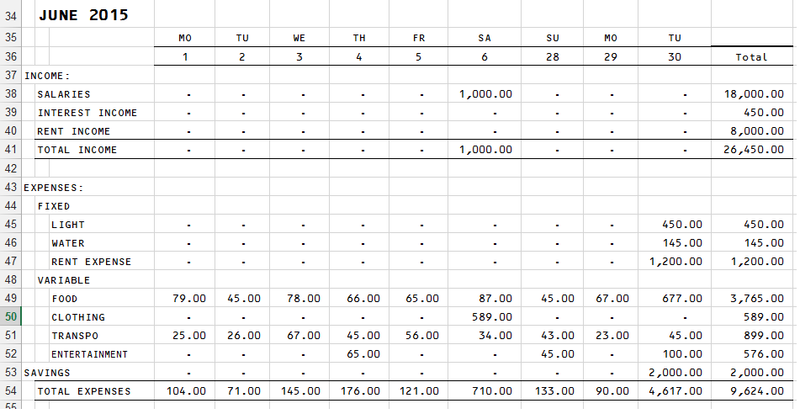 So practically, we have three major items in our spreadsheet : Income, Expenses, and Savings. Income refers to all the receipts of money. We will be using cash basis here, meaning, we will record income every time we received the money. Example of Income are Salary, Rent Income, Interest Income, and Professional Service Income. Use the proper title of the income item to reflect the true nature of the income. Next, we shall categorize Expenses into Fixed and Variable. Fixed Expenses are payments of money that is fixed every month and do not vary on the use or needs. Examples are Utilities, Rent Expense or Mortgage, Property Taxes, Loans, and Insurance. Variable expenses, on the other hand, are payments of money that varies every month. Examples of variable expenses are Food, Clothing, Gasoline, Entertainment, Health Care, Cable Expenses, Newspaper, Donations, and Club Membership Dues. The third category is Savings. Actually, savings can be a fixed or variable expense. Savings can be a fixed expense when you consider paying yourself first with a fixed percentage or amount. It can be variable when you save after all other expenses are paid; however, you only save for what is left over. The problem here is that there may not anything left over. We assumed that the former option is better than the latter. In this demo, we will consider Savings as a fixed expense. 3. Projecting Future Cash Flows - Continue plotting the data from your pocket notebook to your Microsoft Excel spreadsheet for several months. Based on a detailed records for a couple of months, you can now make initial budget estimates. In making budget estimates, make it realistic (conservative estimates) by considering seasonal expenses and one time expenses like Christmas expenses, birthday blow-outs, sale items, or buying a new cellphone. Using the information on the Excel spreadsheets, you can now make conservative estimates for each income and expense item as well as how much savings you can safely allocate for your self. The difference between your actual income, expenses and savings and your projected cash flows or budgeted amounts will be your variance. The variance is favorable when the actual income is higher than the budgeted income or when the actual expenses is lower than the budgeted expenses. Otherwise, the variance is unfavorable. 4. Make Some Tough Decisions - Looking at the variances, you need to explain what is the cause of the difference. Why the actual is higher or lower than the budgeted amount? That information can help you when making decisions. Next, compare the actual income from the actual expenses. Does income exceed expenses or expenses exceeds income? Then, consider the variable expenses. You can either eliminate or reduce this kind of expenses. Fixed expenses oftentimes cannot be eliminated (unless you change the use or plan), but you can find ways to reduce them. 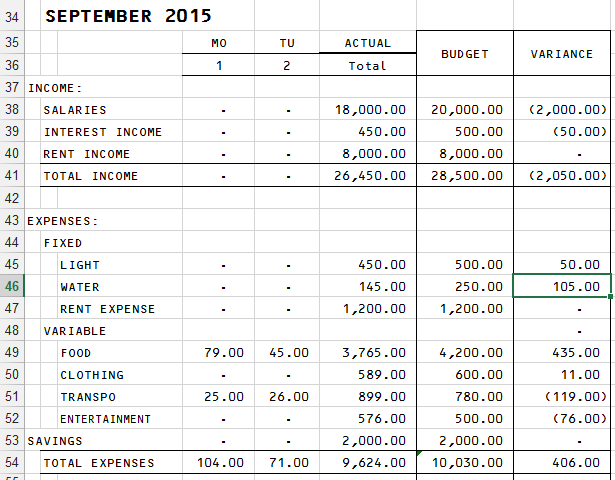 Using these information, you can now adjust your estimated expenses and estimated income for next month budget. From here, you can either raise income or lower expenses like for example by reducing eating out at restaurants, walk to work instead of commuting, quit health club, cut back to basic cable, or drink tap water instead of softdrinks. There are other things to consider when making the next month budget. First, you need to consider inflation in your budget estimates. You also need to plan for intermittent bad things like holiday gifts, taxes, insurance and utilities. 5. Controlling Your Spending - Using your budget, you can now control your spending because you can know exactly where your money goes. You can now at least reduce impulsive buying. Keep tract of each expense item in your budget. You can control your spending by tracking the remaining balance of each budget category. You can do this manually in Excel or use an online tool like www.mint.com. There is one effective method for controlling spending called the envelope system. You need an envelope for each expense category and place the budgeted amount there. You just get from the envelope every time you need the amount. Other methods similar to this will also work. 6. Evaluating Your Performance - Every month, you need to evaluate your progress and performance. Examine your budget with your short-term goals and find out how are you doing. Modify your next month budget for every material information that comes your way. Evaluate if there is a need to reduce expenses and/or to increase income. Adjust long-term goals accordingly. Is there any excess in the income over the expenses? Put it into a temporary savings fund to take care of seasonal deficits or put it into real savings account. Make budget observations and keep track of your expenses, have key goals, and plans to help prevent unexpected shocks. That's it! That is how a simple yet effective budget is made. The steps are simple yet the processes are somewhat long-term. What you need will be patience and persistence to make it worked fully and favorably.